Thornhill College has won a place in the semi-finals of the BBC Northern Ireland School Choir Of The Year, which will take place at Regent House Grammar School, Newtownards. The Thornhill College choir competed against St Dominic’s Grammar School, Belfast, Belfast Model School for Girls, St Louise’s Comprehensive, Belfast and Coleraine Grammar at the heat, which was held in Dungannon. In the senior category Thornhill College choir impressed the judging panel, which is made up of Richard Yarr, Senior Producer Classical Music, BBC Radio Ulster; Ciaran Scullion, Head of Music, Arts Council for Northern Ireland and Rebekah Coffey, soprano and vocal coach. It was Thornhill College’s choir rendition of Cantate Domino that earned them a place in the semi-finals. 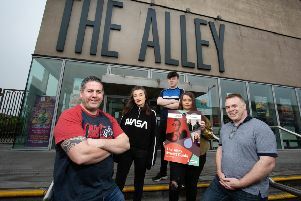 Presented by John Toal and Kerry McLean, the series is recorded at eight venues across Northern Ireland, with the second programme broadcast earlier last Sunday on BBC Radio Ulster. The series will culminate in a live final from the Ulster Hall, Belfast, on Sunday, April 7, and which will also be recorded for the first time for BBC NI television. If you missed the programme, you can catch it again via the BBC Sounds app.